Snapshots: A Musical Scrapbook is coming to Music Theatre International for licensing! Want your local theater to mount a production? Just send them to MTI and make it happen! The catalogue of Stephen Schwartz is re-imagined in an all-new, moving musical. An original new musical featuring the beloved songs of Tony and Academy Award-Winning composer Stephen Schwartz (Wicked, Pippin, Godspell), Snapshots: A Musical Scrapbook is a touching and authentic look into how we fall in love and the poignant power of trusting our hearts and memories. Sue has her bags packed, her farewell note written and the resolution to leave her husband, Dan, after decades of their lives entwined. Finding herself in their dusty, suburban attic for a final goodbye to the life they led, Sue is startled when Dan arrives home early from his all-consuming job. Surrounded by a lifetime of memories and phantoms of their former selves, Sue and Dan embark on a cerebral journey to the past, rediscovering their true love that remained hidden in a lifetime of Snapshots. With a small cast, minimal set and a score of Stephen Schwartz’s most beloved songs re-imagined, Snapshots is ideal for regional and community theatres with a smaller theatre space or black box venues. Snapshots Gets a Rave in Phoenix! But co-conceivers Michael Scheman and David Stern developed a different approach that distinguishes “Snapshots” and makes it smashing. They’ve created a touching story about a long-time married couple who deal with their changing relationship and its impact on the marriage. We see the pair as young teens who fall in love, as an older married couple, and today as they confront many evils. The creators weave 25 Schwartz tunes throughout the narrative to explore in greater depth the myriad of emotions that have occurred. Although I will not spoil the ending, know that the issues tackled are realistic and relevant to most married couples. Each situation is enhanced by Schwartz’s perspective tunes. Unlike many musical revues, about 75 percent of the song lyrics have been changed to fit the story that is set in Sue and Dan’s attic where many things from their marriage have accumulated. While in the attic, many things that weren’t said earlier get dissected. Arizona Theatre Company’s masterful production is staged eloquently by Daniel Goldstein in the cleverly designed attic that permits projections of thoughts and pictures from throughout the marriage. A band plays the Schwartz songs with sublime brilliance that is enhanced by Abe Jacob’s sound that blends the orchestra and the on stage ensemble so not a lyric is missed. A marvelous cast handles the couple at the three stages of their marriage and they essay additional characters that cause other marital stresses. As the contemporary couple, Beth DeVries soulful Sue and Hugh Hastings introspective Dan bring out the pair’s inner thoughts. Tracy McDowell’s Susan and Jim DeSelm’s Daniel, the middle duo, have several experiences foreshadowing the couple’s later problems. Mallory King as the flirtatious but thoughtful Susie and Ben Wynant as the effervescent but clueless Danny are a dynamo of youthful energy. 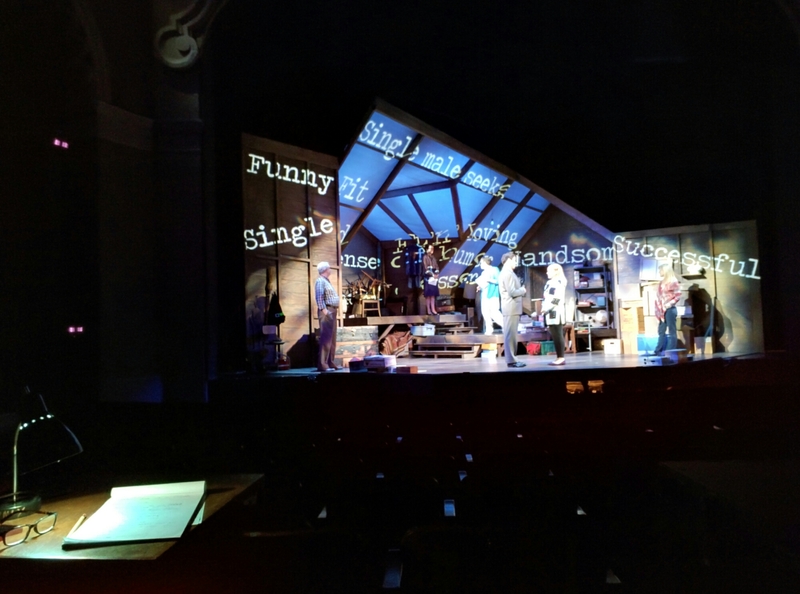 “Snapshots” HAS ITS intimacy make it a better off-Broadway presentation where it can tell its heartwarming story better than in a larger Broadway theater. “Snapshots” plays through January 17 and earns five stars out of five. For tickets, call the Arizona Theatre Company box office at 602-256-6995 or order online at www.arizonatheatre.org. The cast is ready, tech is happening, and the show is almost up. First preview of Snapshots is Saturday! Snapshots is coming to Tucson on November 28th, 2015! Be sure to get your tickets now!